While the restaurant review website Dine Here is mostly good for laughs, rather than reliable restaurant recommendations, I have made a couple of welcome discoveries. I haven’t yet had an opportunity to visit Montreal, but I feel I’ve somehow come a little closer since eating at Estrella’s Montreal Deli & Cafe in Langley. 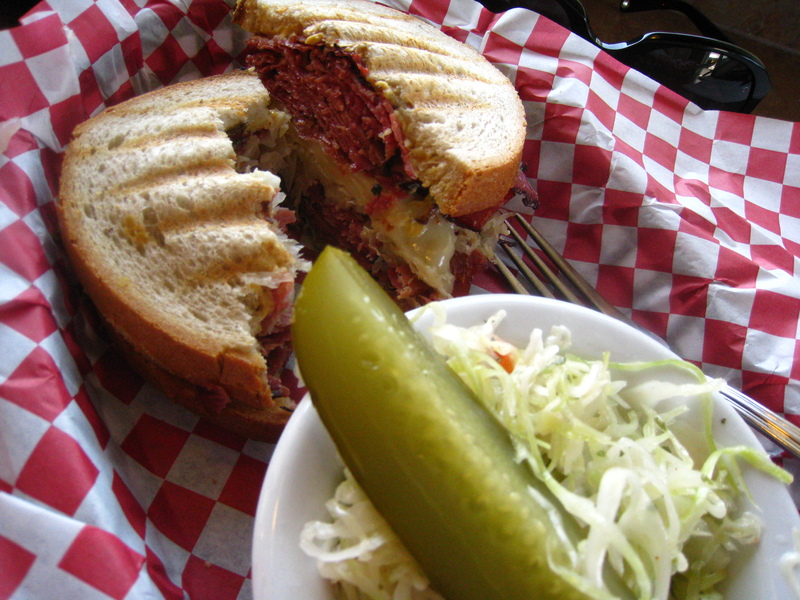 Their Reuben is fantastic, stacked high with their own smoked meat and stuffed with swiss cheese and sauerkraut. The Dijon gives it a kick and the rye has that touch of chewiness that keeps it all together. The pickle spear has a nice crunch and a well-balanced brine. The coleslaw is shredded finely and slicked with a sweet/vinegary dressing. Young Fresh Chef and Exec Chef are both fans, but Little Chef skips the mustard. They both know to hand over their pickle spears to me immediately. Estrella’s has a selection of beverages, but Little Chef goes for the Cherry Coke. Yep, it’s a smoky slice of Montreal right in Langley. Posted in Kid Friendly, Memories, Places, Restaurants, Travel, Treats and tagged coleslaw, Estrella's, Langley, pickles, Restaurant, Reuben, Reuben sandwich, sandwiches, smoked meat. Bookmark the permalink.